Dark Horse Comics for March...and.... BUFFY! March 7 2007, with the description for the first issue. 32 pages, $2.99, in stores on March 7. I dunno about you, but I think I would have noticed had the comic been published 9 months ago. 2007, no? Right after the tenth air date anniversery? It took me about 5 minutes to get what you ment. I hate it when the year changes. But now it's fixed! This is great news to cap off my crappy day. Thanks. I'm really looking forward to this series. I can't wait to see how Buffy is adjusting to her new role as leader and not the sole (active) slayer. Also, how they're integrating the new slayers (especially Vi) and what the other Scoobies are up to. Maybe Dawn has some curse and is growing exponentially. As to other writers for the series, besides the usual suspects of Jane Espenson and Doug Petrie, I'd love to see Brian Lynch have a shot. So far, I think he's written the best comic. I can't tell you how much I'm loving Spike: Asylum. He understands the Buffy universe and the characters. Off topic, but Whedonesque related, if you scroll down further, you'll see the Serenity statutes that are also coming out in March. I'm afraid I don't understand the disco moves. Nor the slightly poofy hair on River. River looks like Discord from Hercules: The Legendary Journeys! Her pose is good though -- can't say the same for Preparation-H Mal and Disco Jayne. March seems too far away right now! Oh man, can't wait. A tiny little qualm: No variant covers? The collector in me itches for some. And the statue description has Joss' name misspelled! Unless Joss Wheden is his evil twin. That could explain 80's-hair River, disco Jayne, and constipated Mal. Wow. This must be the first time I've seen someone complain about a lack of variants. Usually it's the other way around. I'm happy enough without them. 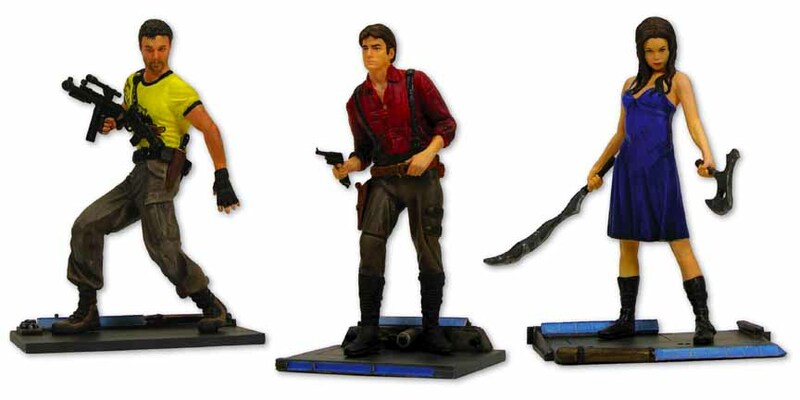 I'm a bit disappointed in the Serenity PVCs as well, after the awesome Hellboy: The Movie PVCs I've got from the same people--maybe these are just prototypes that will be finetuned? Ditto. Although, if it sells well, expect variant to start pop, for the 2nd or 3rd or so on pritings. Which could be major variant thign with new art, or something minor, like what happenned with Fray, with alternate logo colors. Wonder if Dark Horse will ressurrect the old Buffy Zone in their website. I used to spent some time there, back in the previous comic books run days. Hey, I think we can figure out who the "old enemy" is. We've been assuming it's "an enemy from Buffy's past," but really it turns out it could just be an enemy who is old. I know that doesn't help much given the ancient evils battled on a regular basis, but it *DOES* completely eliminate the 6-months-old-at-time-of-death Adam, right? I'm willing to bet that the enemy is the Master. It would tie in perfectly with the 10 yr anniversary thing (March 10th 1997) and to paraphrase from one of the best Buffy scenes ever, it would take us right back to the beginning. Wonder if it'll be a return to the whole concept of the "Order of Aurelius". I really miss Buffy, I randomly inserted a disk in the DVD player a couple of days ago, and rewatched "The Freshman". I recited the lines and cheered through the whole episode. "I'm willing to bet that the enemy is the Master. It would tie in perfectly with the 10 yr anniversary thing (March 10th 1997) and to paraphrase from one of the best Buffy scenes ever, it would take us right back to the beginning." Im not sure Simon, I think the enemy will tie into Dawn's growing pains, and thus, I think the villian is Glory. One of the hallmarks of drama and hero stories is that the villian has to be overcome by the hero, which means the villian needs to be stronger, and I dont think The Master is strong enough to create that kind of tension. In the first season, he was a perfectly acceptable villian, but as the seasons wore on, the villians became more and more powerful because Buffy became more and more powerful. Who better than a God, who technically wasnt killed, only her shell was, to come back and create that tension. Plus, I liked Glory, so superficial Jerry says cool. Ah but as Buffy grows in strength and there's now numerous Slayers to boot, who else are the vampires going to resurrect to help them combat this new threat? It won't be the prima donna Goddess, it'll be the only enemy who has actually killed Buffy i.e. the Master. It's fun to speculate, I've missed those good times. Just because the TV series was good, it won't make the comics any better than okay. (Runs away). (Yes, I'm joking). We have seen Buffy ONCE since the end of the series, in TALES OF THE VAMPIRES #3. And also, yay. My birthday is on March 20th, so, what better early present is there than that? I know some people would rather have live action with the actors (and some just want the characters left well enough alone), but, think about what we're getting. A whole 'nother season of BtVS, written, conceived, and supervised by Joss. Officially sanctioned. I don't think it's hit me fully yet. It's not over. Well, my money is on Glory and/or the monks which made Dawn a key. Yep, it is super cool and I'm looking forward to it a lot. I loves me those characters. I can't wait for this first issue.I'm still hoping Ethan Rayne is the old enemy or even if he isn't,I still would love a return for that character at some point in season 8. They never say the returning old enemy is a big-bad. Maybe Ethan Rayne is the reappearing "old enemy." I can't wait to read this comic. OMG, we are thinking on the same wavelenght Buffyfantic! Beat me to the punch! This is going to be fun! So are we expecting a sell out on the first issue? Dark Horse should definetly stock up on copies. Simon, how do you think the Master will come back? Buffy ground his bones to make her bread. Do you think it will be a faux Master? Am I the only one who couldn't stand the potentials and who dread them 'cluttering up' this comic as well. I mean I could stand the 'creatures' in season seven and so Joss is going to have to work flamming hard to make me find them any more interesting in this. I can't wait for this release. Just yesterday I went to Barnes and Noble and asked an employee if they had any new Buffy books and he took me the section where they keep the books and he's all "I thought Buffy was dead?" and I'm like "Oh no..season 8 in comic book form. soon." And he just looked at me funny and I said "I just really need my Buffy fix" lol. I think that Glory or Ethan Raine could reappear in Buffy's life. I mean, Glory is very powerful so they can have tons of stories on that..and a way to finally destroy her. As for Ethan Raine..isn't he into magicks? This could really give Willow an excuse to use her new profound magicks. Joss needs to bring Glory back just so we have a new name to insert into, "So * is Glory?" I would love to see Glory back. I wanna see her be all funny and sarcastic about things. Someone and Glory have some kind of... connection? Ooh, some of you mentioned Ethan Rayne. That would be lotsa fun; we haven't seen him since "A New Man," when the Initiative dragged him away, so who the hell knows what's happened since then? I've always been curious. And I'm the only person who digs variant covers? Ah, well, I've always been the oddball! And, yo, billz. Been a while, my twin! Or an alternate reality Master. Dark Horse page for the Buffy comic. Wait a minute, so everyone is Glory ? Ah, geek humour. At least it's geeky. Starting to very look forward to this. Ethan Rayne would be cool but i'm still holding out for Doc. Guy's not dead. Fact. In my head. Am I mising something here. Are you telling me that Snyder was Glory? Maybe we can expect that those Knights are still around. Buffy fought them, but they seemed like a larger organization than what we saw back in season 5. Sweet wouldn't be that cool in comic form, so I'm rooting for the dragon (from The Gift). And if everybody was Glory, then does that mean Dawn was Glory, so then Glory *was* the Key? My head hurts. I wish I could preorder these at Barnes and Noble. I've only ordered from TFAW from overseas. Are they faster than stores, domestically? I wouldn't necessarily say faster, but if you want to guarantee you'll get the comic sooner rather than later, they're good. And as someone who doesn't have a local comic shop readily available, I've got no complaints. Does anyone know, if you pre-order, do you get the comics before, after, or the day the comic comes out? ...if you pre-order, do you get the comics before, after, or the day the comic comes out? Haha. Thanks, but I got that part. I ment WHEN do people usually get it if you Pre-Order. I remember getting the pre-ordered item like one day before. But I don't know about the comic. Here's an odd thought--when Giles killed Ben, did Glory jump into Dawn? Is that her "growing pains"? More Buffy is awesome. Plot speculation is also awesome. I thought Glory died for good, the not-come-back kind, when Giles killed Ben. Hmm I like the idea of the Master coming back. Thanks, folks. I'm going to stick with my local unless I hear about a distribution problem. pat32082: I like your theory on Glory jumping into Dawn. No wonder Dawn became all grown-up by 7th season! :p Anyway, that's a good theory that it might be Dawn's growing pains. That Glory is trying to get out of can't take the human side anymore. What's your take on that? Yeah, I dunno. I was just throwing it out there. I mean, the simplest thing is to say her "Key" energy stops being dormant, and *that's* the thing that causes her growing pains, because it can't be confined by a human shell forever, and it was never meant to be. So Dawn as we know her will cease to exist unless there's a way to separate her and the Key. And considering Dawn was made from Buffy's blood, Buffy will be involved somehow. If you want to add Glory to that scenario. then perhaps Glory uses the Key to escape for brief periods a la Ben, which accelerates the Key's meltdown. And Glory realizes, that if Dawn dies, who knows what the Key's energy will do to her, and she might really die this time, too. So, she's put in the awkward position of actually having to work with Buffy, for the sake of self-preservation. But Ethan is just as valid an option, too. Out of military jail, he wants to get some vengeance, and so he attacks Buffy through her sister. Though to me, making things difficult for Giles who's the head of the very organization (well, a similar one), they both hated as rebel youths, would seem more his style. Ethan always was small potatoes. Also, let's not forget Drusilla. She's still around somewhere, and she may be very angry with Buffy over Spike. And it would also be very funny if the Immortal *did* cast a spell over Buffy, and Angel and Spike were right all along. And I bet five bucks that Buffy and Xander flirt with the idea of getting involved at one point. Ooooo, Drucilla. I must admit though, I would be more interested in seeing how Spike would deal with Dru at this point than Buffy. ETA: That would explain Dawn's growing pains too. Guys like Parker are a growing pain in the...neck. I think it is Rack. Dawn is tired of not being taken seriously and goes to Rack for some drugs/magic but "one pill makes you taller while the other pill makes you small"
Dawn takes the first, hence the growing pains. From what I've heard,Faith will be in season 8 but not in the first four issue arc that Joss is writing. One of the reasons I like the idea of Ethan is because I could see him trying to harness the power of The Key in order to spread chaos.And of course because we haven't seen him since season 4. Hmm. I don't think Doc is important enough to warrant Big Bad status for the whole season. I can see him showing up and causing a ruckus, though. Oh and PLEASE keep Dawn to a backstory! I said on dot org that I would really love a Slayer School story line, with Giles and Willow running things.